Folding screens are a great way to make a large room more cozy and to divide the room up for multiple uses. You can find expandable room dividers at many furniture stores, but you can make them yourself for less money. Making the room divider at home will allow you to personalize it to your taste, too. Cut the sheet of wood into 12 pieces that are each 5 feet long by 2 inches wide, and 12 additional pieces that are 12 inches long by 3 inches wide. Typically this can be done for you by someone at the lumberyard or home-improvement store where you purchase the wood. If any of the edges of your wooden pieces are rough, use the sand paper to smooth them out. 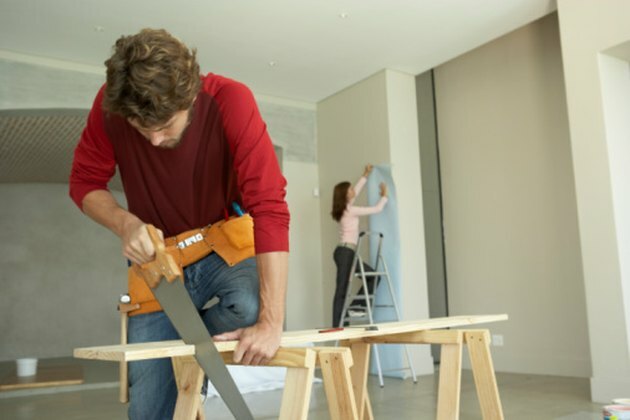 Make frames using the pieces of wood by laying down two of the 5-foot-long pieces parallel to each other and placing two of the 1 foot pieces between them, one at the top and one at the bottom. Nail the pieces in place using the hammer and 3-inch nails, driving a nail into the outsides of the 5 foot pieces and into the ends of the 1 foot pieces. Follow these instructions to make six frames. Paint or stain the front, sides, insides, and backs of the frames. Allow to dry completely before continuing. Attach the three pieces of cloth to three of the frames, using the staple gun and pulling the cloth taut as you go. Start at the top of the frames, then move to the bottom, and finish by stapling the cloth to the sides of the frames. Place the three remaining frames on top of the cloth, so that the canvas or burlap is sandwiched between two frames. Use the 3/8-inch nails to secure the top frames to the bottom frames by hammering a nail in each of the four corners of each frame. Apply the felt furniture pads to the bottoms of your frames to keep the wood from scuffing your floors when you stand them up. Use at least two pads per frame. Connect the frames together using the hinges. Screw one side of a hinge to the top of one frame, 1 to 2 inches down from the top and screw the other side of that same hinge to the top of the second frame. You will place another hinge at the bottom of the two frames, again 1 to 2 inches up from the bottom, and one more in the middle of the two frames. Then, working from the back side of the second frame, you'll connect the third frame to the second frame in the same manner, starting at the top, moving to the bottom and finishing with the middle hinge. Decorate the canvas or burlap however you'd like, using paint, stencils, family photos, or any other embellishments you'd like.